NAMED ONE OF THE BEST BOOKS OF THE YEAR BY "ST. LOUIS POST-DISPATCH, SLATE, "AND" THE THELEGRAPH"
This brilliant new novel by an American master, the author of"Ragtime, The Book of Daniel, Billy Bathgate, "and"The March, "takes us on a radical trip into the mind of a man who, more than once in his life, has been the inadvertent agent of disaster. Speaking from an unknown place and to an unknown interlocutor, Andrew is thinking, Andrew is talking, Andrew is telling the story of his life, his loves, and the tragedies that have led him to this place and point in time. And as he confesses, peeling back the layers of his strange story, we are led to question what we know about truth and memory, brain and mind, personality and fate, about one another and ourselves. Written with psychological depth and great lyrical precision, this suspenseful and groundbreaking novel delivers a voice for our times funny, probing, skeptical, mischievous, profound. 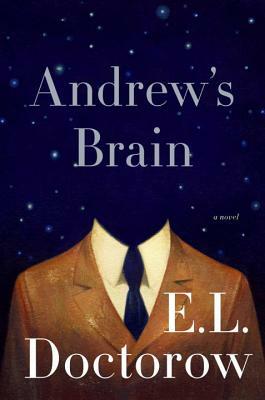 "Andrew's Brain" is a surprising turn and a singular achievement in the canon of a writer whose prose has the power to create its own landscape, and whose great topic, in the words of Don DeLillo, is the reach of American possibility, in which plain lives take on the cadences of history. Too compelling to put down . . . fascinating, sometimes funny, often profound . . . Andrew is a provocatively interesting and even sympathetic character. . . . The novel seamlessly combines Doctorow's remarkable prowess as a literary stylist with deep psychological storytelling pitting truth against delusion, memory and perception, consciousness and craziness. . . . Doctorow] takes huge creative risks the best kind. "USA Today"
Cunning and] sly . . . This babbling Andrew is a casualty of his times, binding his wounds with thick wrappings of words, ideas, bits of story, whatever his spinning mind can unspool for him. One of the things that makes Andrew] such a terrific comic creation is that he's both maddeningly self-delusive and scarily self-aware: He's a fool, but he's no innocent. "The New York Times Book Review"
Dramatic . . . cunning and beautiful . . . strange and oddly fascinating, this book: a musing, a conjecture, a frivolity, a deep interrogatory, a hymn. "San Francisco Chronicle"
An] evocative, suspenseful novel about the deceptive nature of human consciousness. "More"
A quick and acutely intelligent read. "Entertainment Weekly. E. L. Doctorow s works of fiction include "Welcome to Hard Times, The Book of Daniel, Ragtime, Loon Lake, World s Fair, Billy Bathgate, The Waterworks, City of God, The March, Homer & Langley, "and "Andrew s Brain. "Among his honors are the National Book Award, three National Book Critics Circle awards, two PEN/Faulkner awards, and the presidentially conferred National Humanities Medal. In 2009 he was shortlisted for the Man Booker International Prize, honoring a writer s lifetime achievement in fiction, and in 2012 he won the PEN/ Saul Bellow Award for Achievement in American Fiction, given to an author whose scale of achievement over a sustained career places him in the highest rank of American literature. In 2013 the American Academy of Arts and Letters awarded him the Gold Medal for Fiction. In 2014 he was honored with the Library of Congress Prize for American Fiction."